Industrial Cleaners « Global Market Insights, Inc. Awareness regarding personal health and hygiene has been increasing of late. In addition, improving customer lifestyles has led to a rise in the requirement of personal care products. 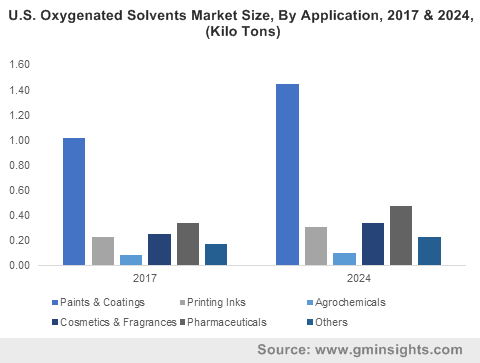 On these grounds, linear alkylbenzene sulfonate market from personal care applications generated a revenue of USD 450 million in 2015 and will collect considerable revenue by the end of 2024. The product is prominently used in the personal care goods, owing to its feasible characteristics such as excellent foam generation, cleansing, and emulsifying capabilities. North America linear alkylbenzene sulfonate market was valued USD 850 million in 2015 and will register significant annual growth rate over the coming timeframe. Escalating requirement of personal care products, cleaners, and dish washing liquids, owing to the presence of a huge customer base will influence the regional industry growth. U.S. will contribute substantially toward North America industry share. Asia Pacific linear alkylbenzene sulfonate industry covered more than 40% of the global revenue contribution in 2015 and will generate considerable revenue with a significant CAGR over the coming seven years. Rapidly increasing population and enhanced livelihood will stimulate the regional growth. The rising per capita income will also fuel the demand for products such as household detergents and personal care goods. In addition to this, deployment of strict regulations regarding health and hygiene along with rapid industrialization will propel the regional linear alkylbenzene sulfonate industry growth. 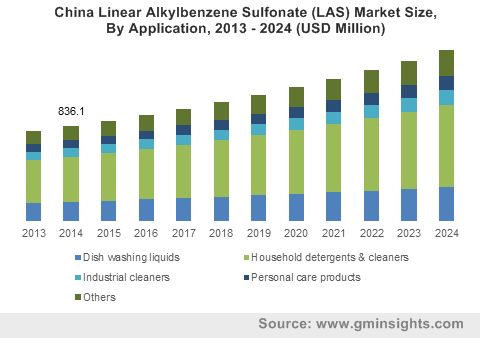 Household detergents and cleaners led the application segment of LAS (linear alkylbenzene sulfonate) industry by accounting over 40% of the business share in 2015 and will exhibit considerable CAGR over the years ahead. Consumers across the globe have been treading toward cleanliness and hygiene standards to maintain good health. Besides, changing preferences of customers along with rising awareness among the people will propel the product demand significantly. Europe linear alkylbenzene sulfonate industry is slated to generate considerable revenue with an annual growth rate of 5% over the coming seven years. This product is extensively used in household detergents and cleaners. Europe has been fueling the demand for household detergents and cleaners as well as dish washing cleaners over the last few years and will continue to be one of most lucrative regional grounds in the future. Moreover, major personal care manufacturers have established their plants in Germany, UK, and France, thereby impelling the regional demand for LAS industry. The key participants in LAS (linear alkylbenzene sulfonate) market are Rhodia SA, Evonik Industries AG, Clariant Corporation, Huntsman Corporation, Stepan Company, BASF SE, The Dow Chemical Company, Croda International, Galaxy Surfactants Ltd., Hansa Group AG, Henkel AG & Co. KGaA, and DuPont. This entry was posted in Polymers and Advanced Materials and tagged Dish Washing Liquids, Household Detergents & Cleaners, Industrial Cleaners, LAS market, Linear Alkylbenzene Sulfonate, Linear Alkylbenzene Sulfonate (LAS) Market, Linear Alkylbenzene Sulfonate Market Analysis, Linear Alkylbenzene Sulfonate Market Forecast, Linear Alkylbenzene Sulfonate Market Future, Linear Alkylbenzene Sulfonate Market Growth, Linear Alkylbenzene Sulfonate Market Outlook, Linear Alkylbenzene Sulfonate Market PDF, Linear Alkylbenzene Sulfonate Market Price, Linear Alkylbenzene Sulfonate Market Report, Linear Alkylbenzene Sulfonate Market Share, Linear Alkylbenzene Sulfonate Market Size, Linear Alkylbenzene Sulfonate Market Trends, Personal Care Products.